« Sensible advice for diabetics? 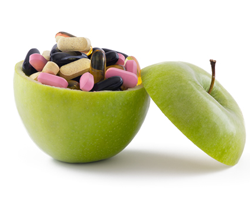 Do your nutritional supplement suppliers understand the products they sell? A couple of weeks ago I had a conversation with a guy who sells a very well known brand of dietary supplements. He isn’t a nutritionist, a nutritional therapist or a dietician. He is one of an army of people making a (very nice as it happens) living selling supplements to friends, family, and associates within a ‘network marketing’ business model. He is completely reliant on the sales messages fed to him by the company marketing the products. So here is what Robert Lustig had to say in the Guardian this weekend…click here. This entry was written by rebalancediabetes, posted on August 27, 2014 at 3:01 pm, filed under diabetes, fat, healthy eating, sugar, Type 1, Type 1 diabetes, Type 2, Type 2 diabetes, weight loss. Bookmark the permalink. Follow any comments here with the RSS feed for this post. Post a comment or leave a trackback: Trackback URL.